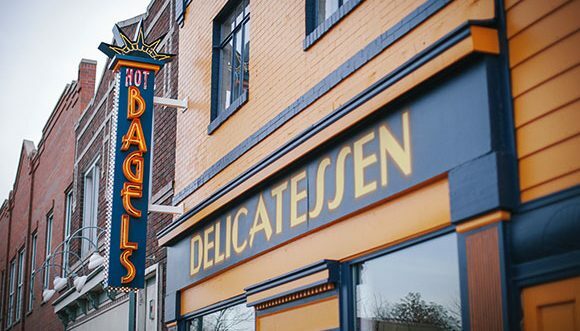 DENVER—It’s mid-morning on a Friday and you stroll in for a bagel and a chat with Denver’s newest bagel-shop proprietor. You find a spot in line—pretty far back, since the line stretches to the back door. Enjoying the savory, doughy smells and warm, neighborly vibe, you watch through kitchen windows as bagels and lox are prepared both quickly and with exquisite care. Now Josh Pollack, owner of Rosenberg’s Bagels & Delicatessen, strolls up smiling, hand extended. He offers a slice of salmon, freshly shipped from Scotland. “How do you like it?” he asks. Samples get passed down the line. Everybody’s day has just taken a delicious turn for the better. Now this, you think, is just like one of those real-deal delis in New York City. Pollack begins to tell you the story of this place. He emphasizes that it took a coalescence of ingredients—family recipes, entrepreneurial drive, culinary passion and University of Colorado business programs—to bring about this standout deli. “Standout” is no understatement, considering Rosenberg’s opened six months ago and has already reaped praise from the New York Times, The Denver Post, 5280, Westword and Company Week. As if lines out the door, here in the heart of the historic Five Points neighborhood, aren’t statement enough. Pollack’s business plan took shape in the Entrepreneur Program at the CU Denver Business School. Much like an authentic New York-style bagel when the right water and flour are combined, his plan gained substance and texture in the annual Jake Jabs Center for Entrepreneurship Business Plan Competition. Pollack finished second in the 2012 event (then known as the Bard Center for Entrepreneurship Business Plan Competition), pocketing $2,500 toward his bagel-store ambition. Pollack, who first earned a bachelor’s degree in business administration (finance emphasis) at CU Boulder, says he always wanted to be an entrepreneur, but he planned to go into real estate or finance. His maternal grandfather had been a visionary—growing a successful real estate business in New York City. His father’s side of the family, meanwhile, leaned toward blue-collar occupations and farming. “I like to say I got the best of both worlds,” says Pollack, who was born in New York and raised in New Jersey. His first entrepreneurial venture was an event production company. The startup went well, but Pollack didn’t see a long-term future: it was a young man’s game with a lot of physical labor and out-of-town touring. With his 30s approaching, Pollack seized on his real passion: food. “Anytime I travel, I eat my way through a city,” he says. cafe where Pollack was able to test out his 100-year-old family recipes on actual customers. “I was really fortunate to get my start there and iron out the kinks,” he says. Pollack explains that there are three keys to an authentic New York bagel: recipe (preferably passed down from generations), process (chain restaurants tend to cut out the Old World handmade process), and water (Catskill Mountains runoff preferred). At considerable expense, Pollack installed a reverse-osmosis filtration device in his deli. The machine strips minerals out of Denver water and then adds them back—in precise parts-per-million ratios that mimic New York City water. The water, plus a high-moisture environment, strengthens the gluten, which, as Pollack tells you, is what any good bagel or pizza maker does. Pollack already has plans to grow and expand Rosenberg’s. Adding space to the kitchen, which would provide room to butcher fish as well as offer catering services, is a top priority. He says he feels “very fortunate and lucky” to have been so successful so quickly. The best part of the bagel biz? Pollack hopes to return to CU Denver to be a visiting lecturer in entrepreneur classes. One thing he’s sure to impart: Pay attention and stockpile every experience—from your childhood to your personal observations to your classes—and apply those lessons to your business. Growing up, Pollack worked at various family members’ delis, but he’d never dreamed he’d be running his own shop.